Does Nokia's HERE maps app have the potential to overthrow Google Maps? Nokia's renowned HERE Maps suite finally made it to the Play Store recently, bringing with it the best free offline navigation that can currently be found on Android. Nokia said that it will halt development of the HERE maps app for Windows Phone, and focus on Android, as well as iOS instead, which hints at more great features ahead. The software features voice-guided turn-by-turn navigation for vehicles and pedestrians, as well as public transport schedules, lane switching and traffic guidance. Of course, the most notable feature of Nokia's HERE maps app is that it supports offline navigation thanks to your device's built-in GPS receiver. 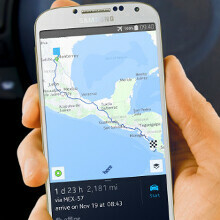 This allows you to explore the map and navigate yourself to a desired location without an Internet connection, and you can use all features of HERE Maps on Android while being offline, HD voices and all. You can download detailed maps of various regions, countries (more than 200 are available for download as of now), and even continents. Said maps are kept on your device, and pave the way for faster access, route planning and rerouting, all while being offline. More than 100 of the maps in question allow you to make full use of turn-by-turn navigation, while 40 of them will provide you with traffic information. Previously such offline navigation apps did cost tens of dollars or euros, and we are now witnessing a rapid decline in their pricing, thanks to the HERE maps suite. The other great free navigation software you can use on Android is, of course, Google Maps, which offers voice guidance, and a ton of other useful features like Street View, too. The bad part is you can only cache a small area for offline navigation, and that doesn't mean you can use turn-by-turn directions if you don't have an Internet connection, too. Thus, HERE maps comes as a godsend when traveling abroad, as those data roaming charges can be pretty steep. That's why we wanted to ask you whether you think that the HERE app offers something more than Google Maps, and does it have a potential to overthrow Google's famous navigation solution further down the road. Take your pick, and chime in the comments below. Both are equally good but offline navigation is a great advantage HERE maps have. Definitely not!!! Although I am a big fan of Nokia but was quite disappointed after installing HERE on my s2. I couldn't even navigate and the map looking very ugly. Google Maps can do offline navigation and save maps as well. Nokia HERE can't compete with Google Maps. Google are champs in whatever they create. Offline is all Here has. Its sadly and poorly drawn out. Very rough looking, aliasing off the wall. Its hard to look at honestly. It definitely is hard to look at and offline mode is almost it's only feature. But it also looks like it tells you the speed limit and how fast you are going. Those two things are actually pretty nice to have that Google and Apple do not, especially if you're driving down a long road that doesn't have good reception and doesn't have hardly any speed limit signs, which happens a lot if you travel across states by vehicle. I wouldn't mind having it as a second app. HERE is extremely accurate. I have hardly found any error while using it, just like google maps. But HERE has an advantage that it works offline too which is a big big advantage, so yes if funded well it can clearly dominate. After getting my 928, I used here maps twice. First time it had me turning where there was no road, then going the opposite direction of my destination. Second time it told me I had 1.8 miles to get to Costco, as I was sitting in their parking lot. I used G maps after that. Still love Nokia phones! 1st place is Here, 2nd place is Google and IOS is off in the distance somewhere. Of course, this is Nokia maps, not some Giggle online gimmick. They haven't halted development for Windows Phone. Don't worry. Phone Arena are wrong and they actually acknowledged that in an update to that article they linked through to but must have forgotten about that when they posted this! Click on the link at the beginning of the article. HERE is owned by Nokia who no longer makes phones. It only makes sense to focus on the OS with the largest market share if you are selling services. HERE just needs an new (and nicer) interface and faster loading times. Naa Offline navigation is hella awesome but if you don't really travel to places that do not have network coverage then its useless. Google's does provide a lot more stuff than just that. Just a random thing I found -Here maps is really really accurate at locating, has never failed me. I use both. Nokia's HERE is full of hype installed it and was not impresed at all, i can rate it to 4/10 against google's. Yeah man! I know what you are saying. I'm using Maps.me for long time. And with the new turn-by-turn nav is awesome. They use OpenStreetMaps. No way. Google brand recognition is too strong. The masses will use Google Maps because they are familiar with it regardless of which app is better. My biggest problem with HERE is it's traffic. It's slow to update traffic changes and the lack of surface street traffic is a killer. I can't use it till they fix traffic. I think that HERE maps are very good but it won't overthrow Google maps because most people use whatever maps is default on their phones. Google maps are worthless without an internet connection. Offline maps are awesome, especially when you'retraveling abroad. On top of that, it doesn't spy on you, or show you ads. Also, google maps app has a terrible interface. Quick to load (GM will be super slow in older device) Offline map support for loading map faster. Speed limit (Awesome part for long driving) Public transport highlight and listing better than Google Map (color in HERE rail or tram lines). I am an android user and using google map all the time (more than regular person used) I can sense what's different between them clearly. DIFFERENT I used HERE on WP so I don't know what different with Android. So I can't make the whole decision for you guys. Just used thing you friendly with.